Magnetic flaps on their own are used widely not only in packaging. Binders often use a magnetic flap for closure, as do some styles of journals and books (Bibles are probably the most common). Even some purses use magnetic flaps to ensure tight closure. The magnetic flap box is also increasingly popular, and that's in part to the versatility--and universal delight--of magnets. It starts with the traditional hinged cigar box. The overlapping hard cover, with magnet, is the additional feature that elevates a simple box into something a little more. While the magnet is the *connecting* piece, so to speak, other elements can take your simple box to the next level. In the example to the side, created for CME4Life, you can see some of our favorite options at work. First and foremost: the magnetic flap. It allows for a seamless design from top to bottom, creating a continuity for the eye to follow. It continues as the user slides their finger under the flap to open, revealing the product in full. This digitally-printed box also features vivid colors. Sunrise can ensure color-matching with this process so that your logo and brand recognition are never compromised in the printing process. It's also laminated. Lamination can enhance colors as well as create another tactile touchpoint for users. This particular example uses matte lamination, one of our favorites. It makes the box as a whole soft to the touch, smooth, and adds a layer of protection to the piece. In short, inserts keep packaging neat and products safe. Made to order for every project, we can ensure that our custom inserts will fit to perfection. Sunrise has a custom tooling department that means no delay or travel between workshops for your packaging creation. Thermoforming is a great option to highlight product features; it's literally like a little stage for your items! One of the most popular options out there. Foil stamping is a striking customization option that immediately creates a sense of luxury for any package. And this is just scratching the surface of what's possible with packaging customization. Contact Sunrise today to design your project! Custom box design is something we not only love, but take seriously at Sunrise Packaging. Our approach is founded in common sense and experience. When anyone encounters an interesting package, their curiosity is automatically piqued. The packaging doesn't have to be unnecessarily tricky, the closure particularly unique. It's a closed box; sometimes, that's all we need to get our imagination flowing. Our job is to get the user excited for your product. We accomplish this by using some of our tried and true methods to create great customized packaging. When it comes to a box, it's not always *just* a box. It's practically passed into cliche to talk about how to maneuver square pegs into round holes. Yet, when it comes to packaging, there's a kind of "single size fits all" mentality that drives organizations to buy boxes in bulk. While we recognize there's no harm in that approach, there's also not much to gain, either. Part of the pleasure of custom box design is derived from the fit. Perfect, every time. In the example to the side, we created this box for Rheem as a thank-you to their customers. While the image might distort the size, it's a large box at 24 inches by 22 inches and 8 inches deep. Just like any bespoke product, a box that's made specifically for your product will always do the job it's designed to do: make your product shine. In the final picture above, you can just see the inside of the box with the custom foam inserts inside. We talk a lot about presentation packaging at Sunrise, and this project is a perfect example. Presentation packaging can focus on the external features, but it's also about how a product (or products) lay inside the custom box design as well. As we mentioned above, everyone wants to be dazzled by an unopened box. Make sure that the reality lives up to expectations with a little padding inside your package. 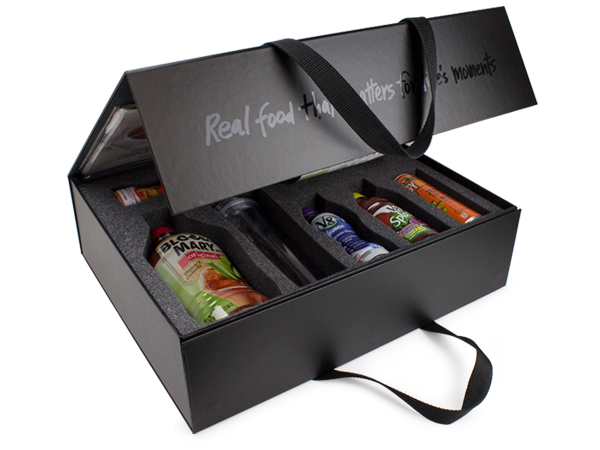 Presentation is all about appearances, and ensuring that your box presents well to customers is key. Yes, the focal point is what's inside the package. But that doesn't mean you get to ignore the outside. We love this example above because it's simple yet stunning. The brand pops out at the viewer, and while you can't touch it through the screen, it's wrapped in soft Nuba paper. Great packaging engages multiple senses; this one does not disappoint on multiple fronts. What's Your Custom Box Style? Just like people, boxes and organizations have personalities. What do you want yours to say? Sunrise can help develop it. Contact our team today! It doesn't matter the age. It doesn't matter the intelligence. Sometimes it doesn't even matter what the product is. The fact is, custom magnet boxes are loved by everyone. If we had to put a reason as to why, it probably boils down to the same reason we've talked about before: magnets are just cool. And super versatile. 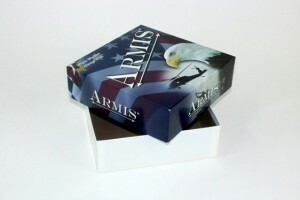 Nearly any box style we produce can be modified to include magnetic closure. Sometimes in the form of a flap, or otherwise, depending on the packaging style. And when we say that nearly every product's packaging is enhanced by magnets, we're not kidding. Check out this piece we created for Haute Smokes. Haute Smokes is a California start-up focused on one of the hottest up-and-coming legalized markets: cannabis. When California legalized marijuana in early 2018, the floodgates opened. Not only does this stand to turn into a multi-billion dollar industry (in no time at all), it's one that provides opportunities across the business spectrum. One way in which this is helping to boost business is in products like these. Cannabis kits and smoking accessories will only grow in popularity and demand as more and more states move to legalize pot. Haute Smokes is on the cutting edge of the market. And they know that it's smart to start with expectations high, especially when positioning their product as sophisticated and glamorous. Custom magnet boxes are the ticket to providing users with an experience before they even view the product. Designed to evoke Old Hollywood elegance, Haute Smokes products are for customers who want to not only engage in an experience, but make an impression. And we're excited to be able to design packaging that reflects that. Customers are immediately treated to the visual experience: art deco-style lettering, embossed with gold. The matte black packaging ensures an immediate impact. The touch of the packaging is soft, with clean lines and crisp wrapping. And upon opening, with the *snap* of the magnet, they're treated to a beautiful product. The magnetic closure is really just one part of the overall experience when it comes to packaging. The secret is to make it subtle--and then surprising. Using custom magnetic boxes is a surefire way to engage users. In an age where customer experience is paramount to earning repeat business, it pays to consider every option. And in our experience, magnets can make that sale. Like any industry, custom promo boxes are subject to trends. Take a look through the different ages to get an idea of what was acceptable (or rather, expected) packaging from just a decade ago. You'll see that it's changed, in every way from shipping time to box design. But what makes this interesting is the nostalgia factor we see creeping into 2018 trends. Customers are looking for some key things when it comes to their packaging needs. They want sturdy custom boxes, a personalized experience and, if shipping online, they want it fast. Different markets respond differently to these base demands, but below we include some tips on the most enduring and prominent trends we're seeing. We've commented on this before, but it's a recurring factor: we can order from any corner of the globe and have it in our home within days. It's truly amazing. Yet these distances can have adverse effects on organic products, like first aid items and medicines. Packaging needs to withstand the trials of travel. One of the top YouTube categories for kids right now is unboxing toys. Yes, you read that correctly. It's people recording themselves unboxing toys. Not necessarily playing with them, or sharing them, or anything else - narrating their experience taking them out of the box. And it's not just toys, you can find unboxings for nearly anything on YouTube and beyond on Instagram, Reddit, and more. It's important to note that upcoming generations, even more so than the current ones, will be critically looking at packaging styles, containers, and above all, personalization. Nostalgia sells. Whether it's garish unicorn-emblazoned Trapper Keepers or Coca-Cola in glass bottles, people are attracted to things that remind them of memories wrapped with happiness. Best of all for packaging design, it's relatively easy to add in a throwback font in design, as well as utilize materials or designs that are evocative of a time past like kraft packing paper or other custom inserts. While we do believe that trends should help inform any packaging decisions, we also want to create innovative solutions. Bring us your ideas and your needs, and let's create something perfect for your product. As a proud Minnesota company, we love all things related to our hometown teams. And on this Opening Day for the Minnesota Twins, we turned our attention to another kind of opening that captures our attention: box closures. If you want to contest the importance of and customer attention to box closures, look no further than your own experience. We don’t doubt that at one point or another, you spent more time than you like to admit lazily flipping open a magnetic box lid. Or slowly slide the top piece off of a setup box to savor the moment of getting a new smartphone or tablet. The delicious moment of flipping up a cigar box top. Design custom packaging that allows users to savor that anticipation. Here are some of our favorite box closures in honor of Opening Day! Far and away one of our most popular features. Magnetic boxes are versatile and instant keepsakes for users. Closures can be embedded in many different types of box styles. Plus magnets are one of the most secure types of closure so products are safe and secure. You might not think a lot about setup boxes having a particular flavor to their opening and closing, but consider again. Setup boxes are a frequently used for luxury goods and technology products for a few reasons. Their rigid chipboard construction, paired with a thermoformed or custom insert, keeps the product secure. These highly-customizable two pieces allow for a high quality finish via the wrap. Most of all, the sleek design is evocative and suggestive of luxury. When someone comes to Sunrise with a project, we do everything we can to bring it into reality – even when it means creating something new and personalized to your business objectives. We’ve taken on new interpretations when it comes to slip cases, gatefold, and more. Contact us today to start bringing your vision to life. Openings are full of anticipation, from the excitement of a new baseball season to revealing an exciting product. No matter which team is *your* team, Sunrise is ready to bring you and your products to the next level of success. Using the term "set up boxes" might make sense to you or it might not. If you're not attuned to the packaging industry, it probably doesn't mean much. But that's where we like to take the chance to educate you. A setup box consists of two pieces. In layman's terms, a top and bottom. The bottom is usually made of strong chipboard with a custom wrap on it. Otherwise known as turned edge, this stylish finish can take on different elements depending on your needs. The top fits snugly over the bottom. Also made of chipboard, it slides on and off easily; you've no doubt encountered this style as it's often used for game boxes, smartphones, and more. As you look through our two piece set-up box gallery, you will see the unlimited potential of this customized box style. Sunrise just completed an interesting variation for Findlay Technologies. By design, this might appear to be another cardboard package delivered by any mail service. Once you read the address label, it becomes clear that this isn't just another mailing box. While pictures don't quite do it justice, the feel of the box gives it away as something special as well. You can't quite tell, but these are set-up boxes. The boxes are wrapped with a digitally printed / matte lamination material. From the corners, you can just the turned edge finishing on them. We love the unconventionality of this box. It takes multiple sets of expectations and flips them, creating a sense of surprise and fun the for the recipient. Here's what we mean. But from that first touch, the customer realizes that it isn't. Part of engaging users is finding ways to engage their senses, and with this design and style, they're all in. And once they open the box, they're treated to even more potential customization. Thermoformed trays, custom inserts, the sky's the limit. Using a design that usurps expectations helps engage users, but it also illustrates different features of a particular packaging style. While these setup boxes share characteristics with others, the content and design are what set it apart. Set up boxes lend themselves well to a variety of finishing options. And their hardcover durability makes them trustworthy packaging for nearly any product. So the lesson that we learn from this? Taking the time to figure out the overall effect you want your packaging to have helps determine the right box style and the right design. Taking something seemingly conventional, like setup boxes, and turning them into something truly unconventional, is a challenge we love taking up. Contact Sunrise today to talk through your needs and ideas for your set up boxes! Minnesota was front and center for the last week of January. As host to Super Bowl LII, our state leaned into the “Bold North” moniker and created a great experience for locals and visitors alike. From the amazing Polaris backflip to Land O’Lakes Farm Bowl, Minnesota’s homegrown brands brought it in a big way. MN marketers might be ready for a break, but not for long. March 2019 will see the Final Four come to Minneapolis. We’re excited to see the stunts and innovation, and can’t wait to help build brand activation kits to support it all. Brand activation is the act of driving consumers to act by means of interactions and experiences designed by the brand. Brand activation kits support these interactions and experiences. As a Minnesota company, we know Minnesota brands, their values and their challenges. Not the least of which is designing an outdoor environment in the subzero Minnesota winter. Sunrise Packaging can design packaging for any sort of brand activation. The goal of any marketing initiative is to garner a response; while it’s one thing to get people talking, it’s another to get them to pay attention and remember your brand. A crazy experience, zip-lining across the Mississippi River, is almost as unique as it gets. However, would it work for any brand? For a brand focused on thrill-seeking and adventure, yes. For a candy store? Not so much. As varied and interesting the various strategies were, there was one thing they all have in common. Minnesota, the Bold North tagline, was front and center for every single one. As Minnesota brands start thinking about their plans for the next major event to come to Minnesota, include brand activation kits in your overall strategy. March is usually a little more moderate in weather than January (well, most of the time). That said, the one million+ visitors who braved the Minnesota winter for the Super Bowl weren’t afraid of a little weather. Neither are we. 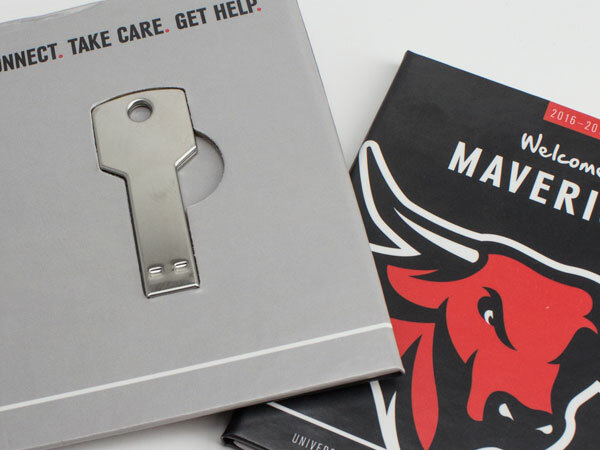 Contact Sunrise Packaging today to design your brand activation kits! As streaming becomes more and more mainstream, its affects on traditional music outlets is interesting. Some people have retreated back to using records and LPs; others are patiently waiting to see who wins out between Pandora, Spotify and Tidal. And through it all, radio continues to be a mainstay. After all, radio is the only that provides live interaction and chances to win. Increase your radio station's relevancy with premium promo packaging. We've all been that person at one time or another: we hear an offer for free tickets or some prize package on the radio and we call in. Most of the time we get a busy signal. But I can remember one shining moment when the surreal happened: I got through. I played trivia on a morning show, and I won. It wasn't anything nearly as exciting as tickets or cash, but it was their album of the week with a t-shirt, water bottle and window clings. It was one of those magical experiences that awesome in nearly every way except for one: the prizes arrived in a plain brown cardboard package. More or less tossed in, with a short note from an intern. Doesn't quite give you the experience you want to talk about, does it? Doesn't really hype up the excitement of winning, does it? When it comes to winning a radio promo package, whether it's tickets, a gift card or more, Sunrise Packaging in Blaine, Minnesota, can help turn it into an event for the recipient. In this world of social media influencers and viral videos, reaction is a marketing strategy in and of itself. Leveraging user generated content is not only low-cost but can yield high returns as well. When someone wins on the radio, it's most fun when they have a massive reaction. Screaming excitement, accidental expletives, it's all part of that live experience (and maybe sound bytes for future radio contest promos). Why dampen that excitement with lame packaging? Whether your radio station giveaway includes tickets, gift cards, or some other special items, make that promo packaging work for you. Create something that's worth sharing. Our examples to the side show a couple types of packaging that get big reactions. The top is our FlashPad Wallet, created for the University of Nebraska. The FlashPad and FlashPad Wallet are perfect for gift cards, concert tickets, and any small items that can ship easily in an envelope. These types of promo packaging allow for plenty of space for promotional copy as well as clear branding. Got something a little bigger? Custom boxes are our forte. The example above - a promotional kit created for Campbell Soup - features a totally unique design. It's a play on the traditional front open box, with handles for easy transport and custom inserts to keep items in perfect order. The design outside the box is black matte with a laminate to catch the eye with every movement. It's a great example of promo packaging that makes sales, and can convert your listeners to influencers. When we talk about influencer marketing, many people miss promo packaging as a key part of the equation. Like we stated above, the excitement of winning something - anything - is worth celebrating, from the moment of winning to receiving the package. Maintain the momentum. Contact Sunrise Packaging today to get started.